When a failure occurs on applications, services and hardware device on one server, the cluster service will switch all the workload on that server to other server in the cluster so it can reduces downtime on applications or services that client is requesting. Adding new server to the existing cluster is easily. If applications or services support clustering, they can be distributed workload on servers in the cluster to improve the system efficiency. Administrator can move applications or services from one server to another server easily in case of disaster or maintenance the system. Microsoft Cluster Service (MSCS) is a software on Windows 2003 server which manage servers to work together as a server cluster. With MSCS, applications and services on the server can be switch their workloads to another server in case of failure. In order to enable this feature, you need to have a shared storage connect to each server called quorum disk in the network. 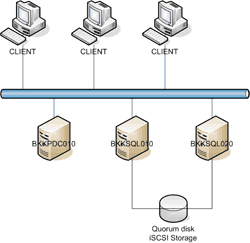 The quorum must be either SCSI, fiber channel or iSCSI interface. If you don’t have the quorum, you can only create a cluster as a Single Node Cluster type which purpose is for developer to test an application in clustering environment only. This type, you can’t switch applications and services to other nodes. Secode type is an Single Quorum Device Multiple Nodes Cluster. In this type, there is a shared storage (quorum disk) between nodes therefore you can switch applications and services to other nodes. Note: There is another type of cluster which is Majority Node Set Cluster which is for enterprise solution so I would mention in this tutorial. There are 3 servers in this environment. The first server is an active directory. The others are cluster nodes. One is for LAN – client communication (192.168.1.21). The other for heartbeat (10.0.0.1). One is for LAN – client communication (192.168.1.22). The other for heartbeat (10.0.0.2). Note: The servers which will be configured as a cluster should have the same hardware configuration to avoid any conflicts. These servers have the same hardware configurations. 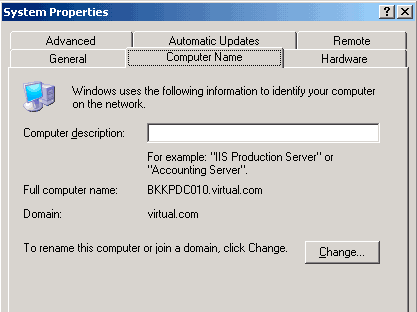 In the next part, I’ll show how to setup iSCSI disks on the servers using Microsoft iSCSI Initiator. What`s wrong If i create the higher size of Quorum ? 512 MB for quorum is it a standard number ? please explain to help me. You can select any size as you want. But on there isn’t much data on the quorum disk so normally, I keep the size not too large. Quorum disk keeps information about cluster’s configuration. It has information which node is active or stand-by. Can I see your IP configure of each computer (3 servers). 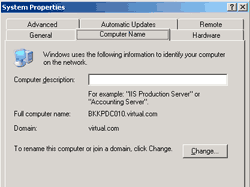 IP Address of the servers are on this post. What’s exactly information you want? Oh! I need the screen for configure IP address and DNS of each server. Thank you so much for this. This helped us a lot.